February saw the launch of the Faculty of Business and Law Health Services Research and Innovation Group. The Health Services Research and Innovation Group (HSRIG) aims to improve the design and management of health services with particular emphasis on interdisciplinary approaches to addressing critical challenges. 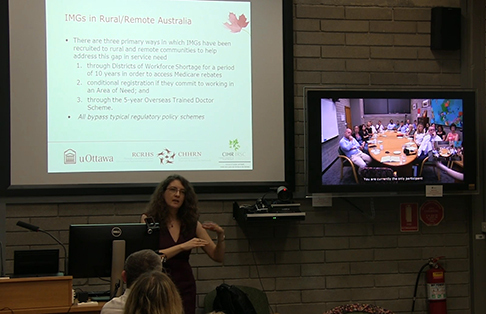 Within the Faculty, this group brings together researchers from Law, Management, Marketing, Economics and Human Resource Management, who join with academics from Faculty of Health and Medicine and researchers from the Hunter Medical Research Institute (HMRI) and Hunter New England Local Health District. The HSRIG have an exciting program of events planned for 2016. To celebrate the launch, we hosted celebrated Canadian academic Ivy Lynn Bourgeault, Ph.D., Professor in the Telfer School of Management at the University of Ottawa. Ivy was recently awarded the Canadian Institutes of Health Research Chair in Gender, Work and Health Human Resources and is now working as an international fellow of the HSRIG. We welcome new researchers to the HSRIG – please contact Rebecca Mitchell or Brendan Boyle or visit the HSRIG webpage.